A Good Gift is a wonderful way to mark a death and celebrate a life. It provides a lasting memorial. Livestock for an African farm - cows, goats, chickens and noisy cockerel - provide livelihood for a whole family. You can include a Good Gift in your will. All gifts from the Good Gifts Catalogue can be made as 'in memoriam' gifts. 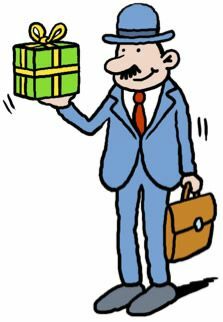 They are gifts to charity (exempt gifts); so do not incur inheritance tax (death duties). Giving an In Memoriam gift through the Good Gifts Catalogue can save inheritance tax. So, for example: endowing a village library would cost the estate £720 (not £1,200); sponsoring a football team would cost £180 (not £300); and planting a drift of daffodils would cost £135 (not £225). Your heir(s) can make a gift, in your name, after your death. If they do so before completing the IHT 400 they can simply enter it under Exemptions and Reliefs. You can make the Gift within 2 years of the death by drawing up a deed of variation and submitting it to the Inland Revenue: you will need to refer to the Inheritance Tax Account, the IHT 400 and its notes. If more than 10% of the estate is donated to charity, inheritance tax is paid at a reduced rate. Contact HMRC for further details. Many estates do not pay inheritance tax and a variation which gives a gift to charity by such estates will not produce a change in the tax position. You only need to submit the deed of variation to the IR if there are going to be immediate inheritance tax consequences. When completing the account for an estate you complete the IHT 400 for HMRC. The form has a section headed 'Exemptions and Reliefs'. Enter the details of the gifts in this section. Probate and Inheritance Tax Helpline: 0845 30 20 900 (The Inland Revenue helpline really is helpful. Contact them on this number and they will guide you through the form filling).